SYNOPSIS - The fellowship of elves, dwarves and men led by Walker Boh has reached the mysterious city of Castledown on their search for the ancient magic whose existence Walker has deciphered from the map held in the hand of a dead Elf Prince. 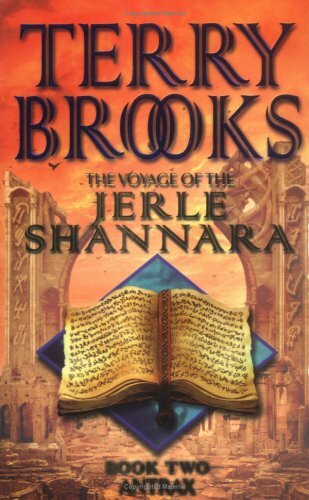 The airship Jerle Shannara carried the company from the Four Lands across islands where magical terrors lay in wait. Now, they face their greatest challenge. Walker's nemesis, the ILSE Witch, has troubles of her own - she knows that she is a member of the famed Ohmsford family, possessors of the Elfstones and Witchsong, but discovers that her younger brother, Bek, is not dead, as she thought. Twisted by the wiles and whispered poison of the Morgawr, her tutor, she refuses to believe the truth about Bek or Walker. Both their lives are in her hands...Within the mechanical mazes of Castledown, Walker discovers great secrets...which may cost him more than his life. EXCERPT - Arms of iron clutched Bek Ohmsford close to a body that smelled vaguely fetid and loamy, of earth and chemicals mixed. The body moved with the swiftness of thought, sliding through trees and brush, shedding layers of itself like skin, shadows that hung dark and empty on the air and then faded away completely. Some exploded into bits of night as the magic of the Isle Witch caught up to them, but always Bek and his rescuer were one skin ahead. FL Speak - Antrax continues from where Isle Witch ended. The survivors are marooned in the island called 'Ice Henge' where certain death awaits them. The last book ended with Bek Lowe aka Bek Ohmsford (yes, that was a stunning revelation) finally confronting the Isle Witch, who turned out to be his elder sister Grianne Ohmsford. Though the ILSE Witch doesn't believe a word of him and insists that this was another game and illusion her enemy, the Druid Walker was playing to catch her off-guard. But even she couldn't dismiss the claims completely as she realised that Bek had the wishsong magic with him too, which was the legacy of the Ohmsford family. Meanwhile, Walker enters the ruins of an old city laden with traps. Quentin Leah and the others watch helplessly as red lasers (yes, lasers. Its turning out to be more sci-fi) cut through half of their team. They see their comrades fall to those lasers and metallic chain like things called sweepers and are forced to backtrack leaving Walker alone. Bek and Trulls are on the run with the Isle Witch on their trail. The rovers abroad the Jerle Shannara are attacked by mwellrets and find themselves captive. Things turn to their favor when they manage to overpower their captors and take the ship to safety..... but doing that meant leaving the others behind. The young seer Ryer finds the elven prince hiding and together they search the catacombs for Walker. (And this is where they just lost me!) Apparently, the Druid realizes that there are no books of magic, instead all the data of the lost civilizations are stored in cd and dvd's (how's that for a shocker? Looks like civilization was much advanced before the Elves came. And i thought Elves were the most civilized, after humans ofcourse) Brooks brings back modern world into his tale. Its okay to meddle and experiment, but there is a reason why the genre is called fantasy and not reality. Anyway, after they manage to free Walker from the clutches of the wraith like operating system called Antrax, Walker is forced to destroy it after realising that Antrax could grow even more powerful if it is not stopped. In that battle, the Druid is mortally injured and when the Isle Witch comes to meet him one last time, he somehow manages to make her see the truth by facing the 'Sword of Shannara'. In the end, it is seen the shade of Allanon appearing to take the last Druid of Paranor with them with Grianne Ohmsford crumpled in a comatose state. Another excellent writing by Brooks. Though i have made it clear of my distaste of modern reality mixed with fantasy, we can safely say that, it doesn't affect the quality of the plot whatsoever. The adventures continue at a break neck speed and often you are caught in the world of the band of people stuck in that island. Book 2 didn't have as much impact on me as i wanted but hopefully the final part promises to be much more exciting.